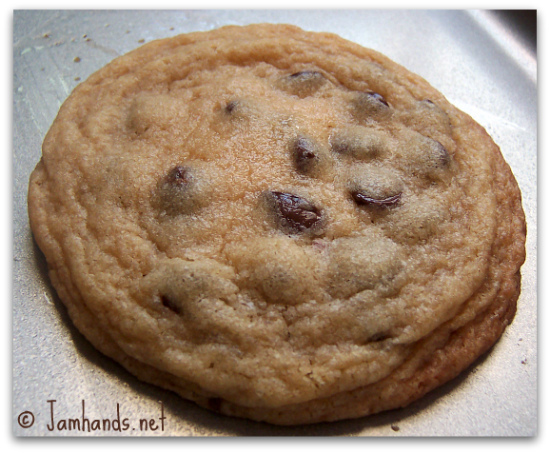 There is something about the sight of a just barely undercooked chocolate chip cookie that is drool inducing. Once the cookies cool and set up a bit, they are the perfect combination of browned and chewy on the outside, and soft and gooey on the inside. Perfection. 2. Line 2 cookie sheets with parchment paper. Sift together the flour, baking soda, and salt into a medium bowl and set aside. 3. Place the butter, sugar, and brown sugar in the bowl of an electric mixer; cream together on medium speed until light and fluffy. Scrape down the sides of the bowl with a rubber spatula. Beat in the vanilla and eggs. Gradually add the dry ingredients to the creamed mixture and continue to mix until a smooth batter forms. Turn off the mixer and fold in the chocolate chunks using the spatula. 4. To form the cookies, scoop about 1/4 cup of cookie dough into your hands and roll it around into a ball; place them about 3-inches apart onto the prepared cookie sheets; you should get about 4 cookies on each pan. Press down the tops of the dough slightly and bake until the cookies are light brown, 12 minutes for chewy cookies, or about 15 minutes for crispy cookies. 5. Allow the cookies to cool on the baking sheets for 5 minutes before transferring to a wire rack to cool completely. Repeat with remaining dough/cookie sheets. That's how I like my cookies cooked as well-a little underdone in the middle. Looks yummy! Wow! 5 inches big! Awesome! I must try to make my cookies that big too:D more to eat! Oh yum. I wanted to eat it right off your blog. Can't wait to make a batch or two. Those cookies look spectacular! You are making my mouth water. i lovee chocolate chip cookies! and this one looks great! There is nothing better than homemade chocolate chip cookies and I agree that slightly underbaked is best. Yours look perfect! Hmmm I'm not sure what to make first these cookies or the chocolate chip pecan bars..